Terica Adams ’12 teaches participants techniques of a style of dance called Danceball in the first workshop of Hamilton National Dance Day. Whether or not you’re a dancer, are curious about dance, simply need a fun break, or want to support a good cause, Hamilton National Dance Day (July 25–26) will provide the opportunity to join the nation in dance and support future local dance programs. As part of the cultural celebration, dance workshops will be taught by a mix of students, current and past, as well as local dance instructors. The workshops will include zhumba, hip-hop, belly dancing, ballet, and modern. On Saturday at 5 p.m., the two-day dance festival will culminate in a variety show in Brehmer Theater, where all of the participants will come together to show the community what they’ve learned. A collector’s football, autographed by 75 NFL players and staff from the league’s 2013 season, will be auctioned at the show, thanks to Green Bay Packers President and CEO Mark Murphy ’77. 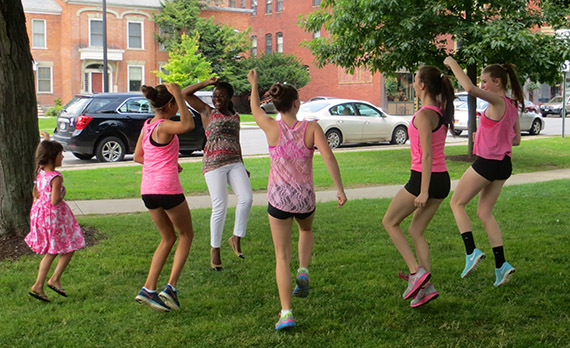 “No matter what the age, skill level, or talent is, dance is a way of self-expression and a way to cross barriers, whether social or cultural, because everyone is participating in a shared experience,” said Terica Adams ’12, the executive director of Hamilton National Dance Day. Adams also works as the training program coordinator at the Association for Financial Professionals in Washington, D.C.
National Dance Day, which was set in motion in 2010 by So You Think You Can Dance co-creator and Dizzy Feet Foundation co-president Nigel Lythgoe, takes place annually on the last Saturday in July. Adams wanted to bring the event to Hamilton after witnessing the positive social impact at the National Dance Day in Washington, D.C. The proceeds from the Hamilton event will be given to the performing arts at Colgate, the Hamilton Center for the Arts, and the Dizzy Feet Foundation.